With the Tornado retiring from the Royal Air Force, there have been quite a few special schemes showing up. Many of these combine that retirement with anniversaries, as several units are also celebrating 100 years of service. 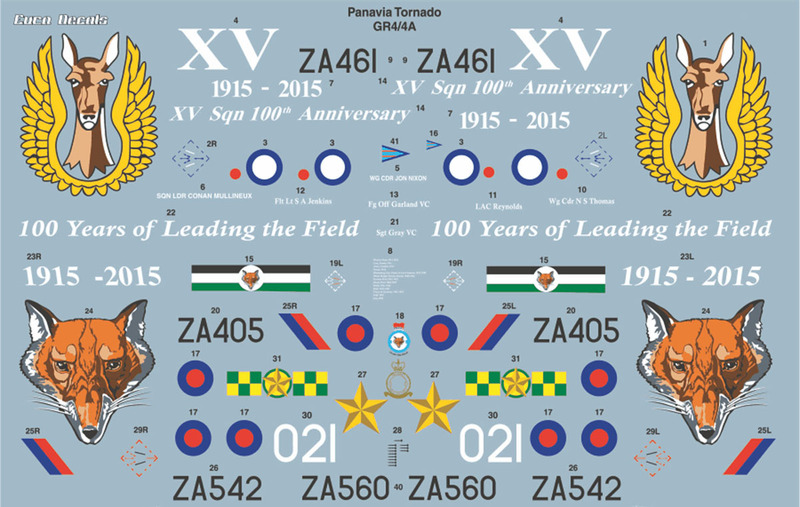 This latest sheet from Euro Decals covers five aircraft, four of which feature anniversary markings. The set comes on two sheets, which is not surprising given the size of a 1/32 Tornado kit. The units covered include 12 Squadron, XV Squadron, 31 Squadron, 41 Squadron, and 617 Squadron. 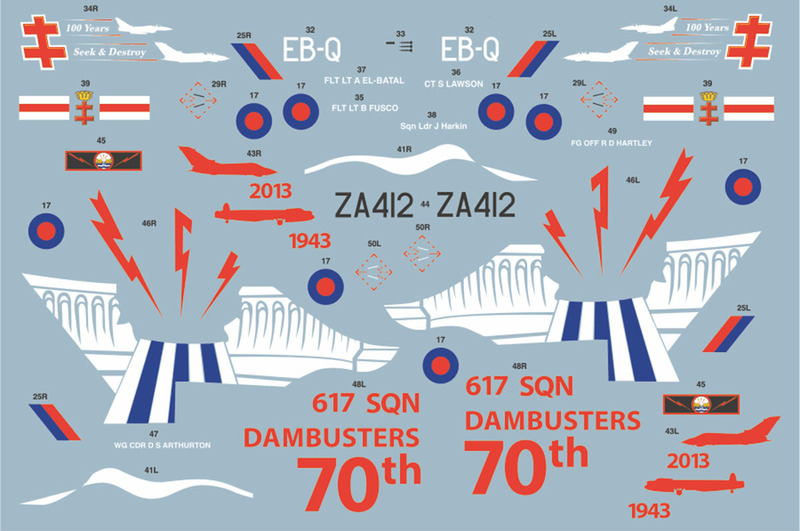 Three are marked up celebrating 100 year anniversaries, one is a standard scheme, and the 617 Squadron aircraft memorializes the 70th anniversary of the Dambusters Squadron. Starting with 12 Squadron, this aircraft is ZA405, a Tornado GR.4A. It features the squadron colors of black, white, and green in large stripes across the vertical fin, with the unit's fox head emblem centered. The years 1915-2015 are on the fin tip, and the slogan "100 Years of Leading the Field" run down the spine aft of the canopy. The rest of the markings are standard, as is the camouflage. For XV Squadron, this option is ZA461, a Tornado GR.4. Like the 12 Squadron aircraft, the spine and vertical fin are painted up, this time in red trimmed in blue. The squadron emblem of a deer's head surrounded by wings is centered on the fin. This aircraft had red, white, and blue roundels instead of the red/blue standard options. The last of the 100 year anniversary aircraft is ZA560, a Tornado GR.4 from 41(R) TES Squadron. This aircraft is not nearly as fancy as the previous two, being finished in a stock camouflage scheme with standard squadron markings. For the anniversary bits, this is restricted to a simple emblem on the tail that has a silhouette of a Tornado an a Eurofighter, with the message "100 Years Seek & Destroy" next to them. The last anniversary aircraft is ZA412, a Tornado GR.4 from 617 Squadron. This is a standard camouflaged Tornado with the vertical fin painted black. On the fin is a stylized representation of the broken dam in white, with blue and white stripes streaming out from the opening. A Tornado and a Lancaster silhouette are in red, as is all the text denoting the anniversary. Finally, for those who want to do a more bland Tornado, there is a stock example from 31 Squadron. This plane is ZA542, a Tornado GR.4, that was based at Gioia del Colle, Italy in 2011, where it took part in Operation Ellamy. The standard squadron markings of green and yellow checks are on the nose, and there is a star on the vertical fin. Like all the other options, the camouflage is overall medium sea gray. The decals are well printed with excellent color. For the anniversary schemes you will have to paint the vertical fins yourself, but that is far better than trying to apply a decal that size to the kit. 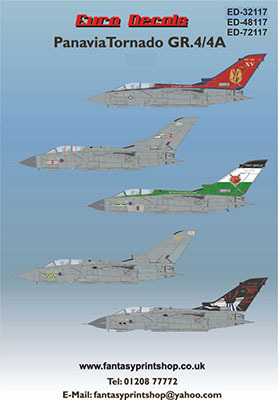 There are not many options out there for 1/32 Tornado decals, so this sheet is a welcome sight. The options are colorful and should brighten up any finished model. According to Fantasy Printshop, this sheet will soon show up in 1/48 and 1/72 as well, so if those are your scales, stay tuned for those releases. My thanks to Fantasy Printshop for the review sample.